This week’s #LiftEVERYvoice segment highlights Lena Baker, a survivor who was convicted of capital murder of her white employer, Ernest Knight. Lena Baker fought to be a survivor during a time where violence compounded the oppression and poverty that saturated her days, as like the life of those like her. Being poor, Black, and a woman with three children in 1940s Georgia, she was fatally penalized and criminalized for surviving the fight for her life and daring to exist as a Black body capable of defending itself. In 1944, Ernest B. Knight, a white, gristmill owner, known drunk, and gun brandisher, kidnapped and sexually assaulted Baker after hiring her to care for his broken leg. Knight abused and locked Baker in his gristmill for days at a time despite her efforts to get away and stay away. Those that knew of his deeds, like Knight’s son and the Randolph County sheriff, beat her (the former) and threatened her with jail time (the latter) instead of addressing the actual perpetrator — a father and local businessman – which is something we still fail to do over 70 years later. After being kidnapped again, Baker fought an iron-bar bearing Knight where the latter was ultimately killed. She did not run and hide after. Baker turned herself in, vehemently claiming self-defense. Yet, the 12 white men that made up the jury of her peers (ha) found her guilty in less than four hours. Despite being granted a reprieve, she would later be denied clemency and housed in the men’s section of Reidsville State Prison until a few days before her execution. She was electrocuted while boldly maintaining her right to defend her body and life. Baker was retrospectively pardoned in 2005 by the State Board of Pardons and Paroles. Their reasoning was that her case was erroneous, and she could have been charged with a lesser crime like voluntary manslaughter. However, this still undercuts her right to defend herself against an attacker. She should be deemed nothing less than innocent. The headlines in the Cuthbert Times following Lena’s death read, “Baker Burns.” Ernest B. Knight has been labeled as nothing, making him a perpetrator at large, even in death. However, I choose to remember Lena Baker as a woman of perseverance, valor, and honor. She is a hero. 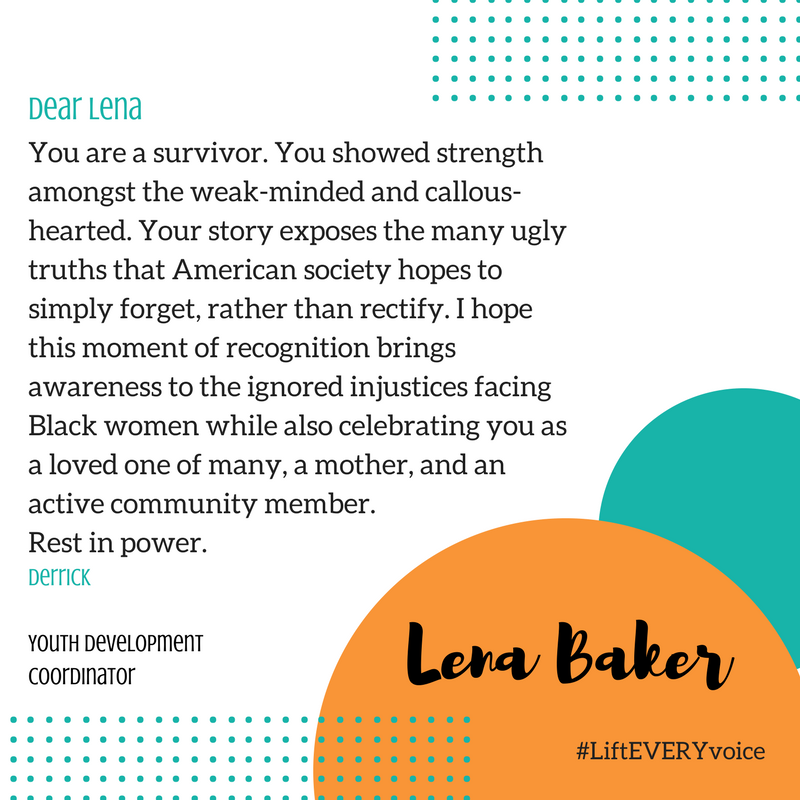 #LiftEVERYVoice is a movement created by STAR® to amplify the voices of survivors silenced by racial oppression. We seek to uplift, support and empower survivors of color.